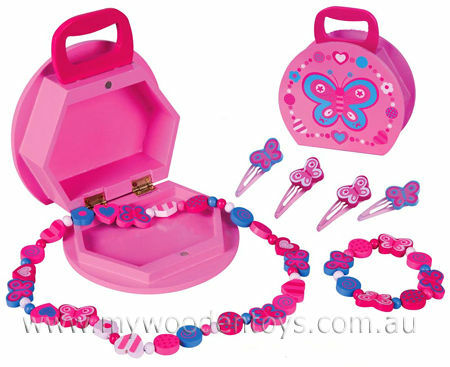 Butterfly Case Wooden Jewellery Set is a pretty pink hinged case full of hair-clips, a necklace, bracelet, and a ring. This case doubles as a carry around wooden suitcase and a jewellery box and has a very nice painted butterfly design on the side. The whole case opens on gold hinges and snaps shut and is held in place with a small magnet. The bracelet and necklace are made of wood and threaded onto elastic. The hair clips are metal with wooden butterflies glued and screwed to them. The little ring is also wood on a metal adjustable band. Material: Wood, Elastic, Child -safe paint, Metal Clips, Metal Ring Band, Magnets. We like this because:"Beautiful little set full of all those wonderful things to make dressing up even more fun."